If you are unable to connect to tfaw.com, you likely have a browser that doesn’t support TLS 1.2. Please read the below information carefully, as you won’t be able to visit or purchase from TFAW.com until you upgrade your browser. For PCI compliance reasons, we stopped supporting browser encryption older than TLS 1.2 on June 26th, 2018. Please upgrade your browser or enable TLS 1.2 to continue using TFAW.com. You will not be able to access TFAW if you don’t upgrade your browser. TFAW takes security very seriously. The Payment Card Industry (PCI) Security Standards Council is an organization that sets security standards for websites that handle credit cards. The newest revision of their policies requires that we disable security protocols considered to be outdated and insecure. We made these changes to remain PCI compliant and to continue operating. As of this deadline, we’re required to block any browser connection to TFAW.com that does not use at least the TLSv1.2 secure connection standard, which may prevent some people from viewing our site. How Am I Affected As a Customer? A secure connection requires that both the sending and receiving ends work together. This means that not only must our end be secure, but as a visitor to our site, so must your browser. If your browser is too old, you may not be able to access our site and may find yourself reading this blog post to determine why this is happening. If you’re using a current web browser, then you should already be protected. If you’re unable to connect to www.tfaw.com, you may need to upgrade your browser version, change your browser’s security settings, or even upgrade your computer’s operating system. More details on how to do this can be found at the bottom of this post. Online security is always evolving. As vulnerabilities are found in older security standards, new standards are created to address those vulnerabilities and increase security. One such type of security is the Transport Layer Security (TLS) protocol, which makes sure that information passing between your browser and a website is encrypted and unreadable to outside parties. The PCI Security Standards Council has determined that vulnerabilities in versions older than TLSv1.2 are at risk for being breached. In response to this, the newest revisions to their security standard establish a new baseline for the level of encryption that must be used by sites that process credit card information. As a website that processes credit card information and a company that values our customers’ security, we updated our security to meet the deadline for this upgrade on June 30th, 2018. What Does All This Technical Mumbo-Jumbo Really Mean? When you’re viewing a website, a lot of information is being sent back and forth: Information about the site and what it looks like is sent to your browser so you can view it. When you submit information like your address and credit card for a purchase, that information is sent from your browser back to our website. This information can either be unencrypted (“http://”) or encrypted (“https://”). Transporting this information is like putting important files in a car and driving it to another location. An unencrypted connection is like driving a regular car with the doors unlocked; someone could stop the car along the way and get all the files inside. An encrypted connection is like using a security truck, with features to make sure no one can get anything inside while it’s moving. However, even with a security truck, there can be different levels of how difficult it is to break into the truck. This is like the different types of encryption protocols which have names like “SSL 2.0”, “SSL 3.0”, “TLS 1.0”, or “TLS 1.2”. As technology advances, criminals have learned how to break into older security trucks, so we learn to build bigger and stronger vehicles. However, having a big security truck moving all your files means you need a big garage in order to park the truck and unload it. If your garage isn’t big enough, you won’t be able to park any of the new security trucks that are sent to you. In this case, your web browser is the garage. The PCI Security Standards Council is saying that we can only use the newest, safest trucks to transport your information, so your garage has to be big enough to receive them. If your web browser does not use support newest security standards, you won’t be able to use those protocols to send and receive information, and you won’t be able to access our website. How Do I Make Sure I Can Access TFAW.com? There are several factors that can affect whether your browser supports the latest security protocols, including your browser version, your browser security settings, and even your operating system version. You can go to www.howsmyssl.com and look under “Version” to see what version of TLS your browser is using. If it lists anything lower than TLS 1.2, here are the steps you can take to ensure that you are using TLSv1.2. It’s also possible that your browser supports TLSv1.2 but it needs to be manually enabled. Note that these instructions may not work across all operating systems and devices. You may need to search for instructions fitting your circumstances. Scroll to the Security section, select the Use TLS 1.2 check box, and click OK.
Open a Firefox browser and enter about:config in the address bar. When prompted, click I’ll be careful, I promise! and accept the warning. Double-click security.tls.version.max and change the value to 3 to configure the browser to support TLS1.2. Select “Settings” or “Preferences” from the application menu. Scroll down to the “Security” section. Locate and check “Use TLS 1.1 and TLS 1.2”. Then, press the “OK” button. There are no options for enabling SSL protocols. If you are using Safari version 7 or greater, TLS 1.1 & 1.2 are automatically enabled. Most customers shouldn’t be affected by these changes, but if are using outdated security protocols we highly recommend you update so you may continue to access TFAW and your other favorite online stores. If you were redirected here from TFAW.com, then we recommend you upgrade or change web browsers. You will need to resolve this problem in order to shop at TFAW.com. If you have any questions, please contact service@tfaw.com. Now’s the time to stock up on graphic novels and comics, folks! TFAW is giving you a jump on your holiday shopping (or an excuse for you to treat yourself) now through November 13th. All you need to do to get Free U.S. Shipping on your next order is place $35+ of in-stock comics and/or graphic novels in your cart. Then, activate the coupon by visiting the offer page or inputting the SNOWBAT code into the shopping cart and hit the “Apply” button. That’s it. Boom. Mic drop. You’ll see a message in your shopping cart if the offer is successfully applied. We don’t do offers like this too often, so if you need a little help making sure everything’s squared away, feel free to use our Live Chat feature or call our customer service team from 9AM-5PM (PST), or drop us an email and we’ll get back to you. This deal doesn’t come around very often, so be sure to carve out some time today to go through last week’s new releases or browse the TFAW website for the comics and/or graphic novels that will join the rest of your collection. The magic date is November 13; after that, this deal will evaporate! Leave your brains safe at home and come celebrate a release of the new Plants vs. ZombiesTM comic book miniseries with artist Ron Chan and colorist Matthew J. Rainwater on Saturday, June 20th from 12:00 to 3:00 p.m. at the Portland TFAW store. Make sure to bring the kids! Come down to enjoy fun activities that we have planned for the kids. Join us to make your own flower or zombie mask and take a picture in our special photo booth. Free snacks and beverages will be provided. Based on the hit PopCap® video game franchise and published by Dark Horse, the new monthly Plants vs. ZombiesTM comic will reveal all about Dr. Zomboss’s crime-filled college years! Nate, Patrice, and Crazy Dave will find Neighborville besieged by two zombie armies in this hilarious romp for all ages. Plants vs. Zombies: Bully For You #1 and other Plants vs. ZombiesTM titles will be available for sale at the event. Don’t miss out on all the silly fun with Ron Chan and Matthew J. Rainwater at the Portland TFAW on Saturday, June 20th from 12:00 to 3:00 p.m.
As part of our monthly Product Review Contest, we’ve picked three reviews and are awarding $25 gift certificates to the people who posted them. 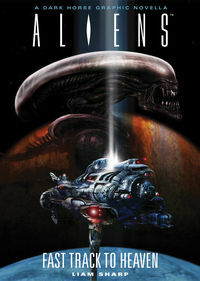 Aliens: Fast Track to Heaven is an excellent graphic novel. [Writer Liam] Sharp’s original setting and characters capture feelings of claustrophobia and utter helplessness in a way that truly honors the memory of the first film. The writing is very well done but what really made the book for me is the artwork. The angles, character models, and the use of color as a narrative device for transition are all done beautifully in a dark and cramped environment. The alien creature itself is one of the best designs for this franchise that I’ve seen. The Panel of its introduction deserves a frame and a place on the wall. I have read a lot of Aliens comics published by Dark Horse and this is without question one of the best. Aliens: Fast Track to Heaven was my first exposure to Liam Sharp’s work and it has me compelled to keep an eye out for more. This book brings back my childhood memories when comic-books surprise you since we don’t have big solicitation catalogs back then. It collects three sets of stories (X-Men, X-Factor & New Mutants and some tie-ins) that are linked throughout the Marvel Universe. 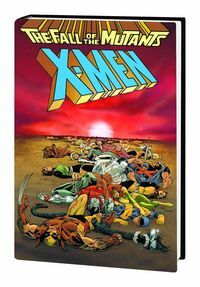 In brief, The X-Factor portion sets Apocalypse as the Big Bad, X-Men fights for their lives, win some, lose some, and the New Mutants lost a dear friend. I can say, some historic moments are collected and presented here that still have some ramification until now. Better than the originals. I own the originals, and it is nice to have them all as one complete set. Plus the paper quality is better and so is the color. They did a nice job putting this collection together. Just wish they used the same artist every time, still it is nice to see the different interpretations. I think the story interpretation held up well. We want to thank everyone again for sharing their product reviews last month. You guys really do a lot to help other customers each time you submit a review. Thanks for your efforts! You don’t have to like the product to snag a winning review, so feel free to rant or gush. So submit your reviews and help your fellow collectors, and us, sort out the “HOT” from the “NOT”! Who knows, you may be one of next month’s winners. Click on it and our product review form will appear in a popup. Just fill out the pertinent information and submit your review, and you’re done! We’ll take a look at your review and get it up on the product page soon thereafter! There’s also a really easy way for you to call up everything you’ve ever ordered from us and review it. Simply log in to your account and go into the Order History Section. Next to each item, you’ll see a “Review it!” link. There are a lot of reasons to start up a comic book subscription at TFAW.com. One of the best reasons is that subscription matches for this month will be 30% off! *Math: $2.99 x 20% = $0.60. 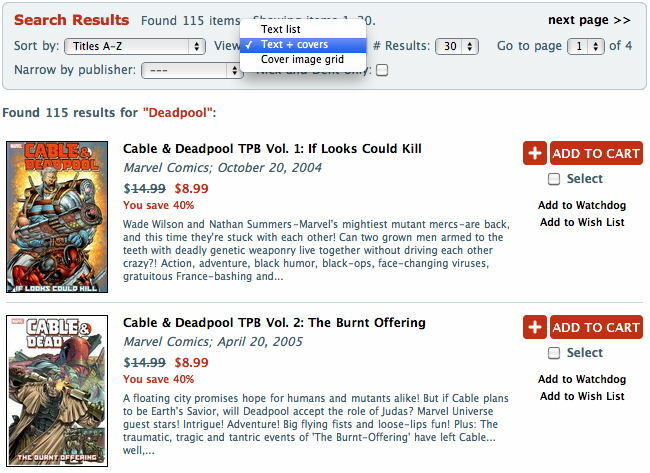 $0.60 x 5 issues (@ $2.99) = $3.00 (or 1 $2.99 comic every sixth issue). 2) Guarantee your copy-Ever walk into a comic book shop to find that they just sold the last copy of the book you went there to pick up? Yeah, that won’t happen again. Gone are the days you resort to an eBayer to fill the gaps in your series. 3) Never forget an issue again-If you’re like me, you forget things from time to time. With so many great comics coming out each month, it’s hard for even the most avid comics reader to remember every issue they wanted to pick up. Set up your subscription once and it’ll be in there until you’re old and gray, my friend. (Or until they retcon the character or bring in a new creative team and you decide it’s not for you anymore). 4) Comics come to you now-You don’t have to brave the elements to get your comics. No longer do residents of Phoenix have to go out in 113° heat to get their copy of Detective Comics featuring Mr. Freeze. Nor do folks from New York City have to trek 12 blocks in the snow to find out which Fantastic Four character just died. We’ll do the work: carefully pack up your comics, and ship ’em to your door. Our subscription service can be as simple or complex as you want it to be. Subscribe by series that we’ve set up, or use our “Keyword” subscription and be sure to pick up mini-series, one-shots and other pesky issues you can’t live without. Spiffy, huh? I want you to take five minutes to read over our Subscriptions page. The time it takes to figure out our subscription system and set up your subscriptions will far outweigh you searching through TFAW each week/month for your favorite titles. We’ve got a handy walkthrough set up so you can see how easy it is to get your subscriptions started. As always, we’re available via Live Chat (M-F 9AM-5PM PST) to help troubleshoot any problems you encounter along the way. 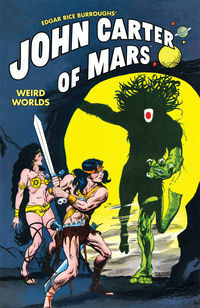 BONUS: Sign up for a subscription by 2/23/11 and your first matches will be 30% off (FEB11 comics)! There are three ways to display search results at TFAW. Once you try ’em out and decide which one works for you, you’ll be able to search with ease. 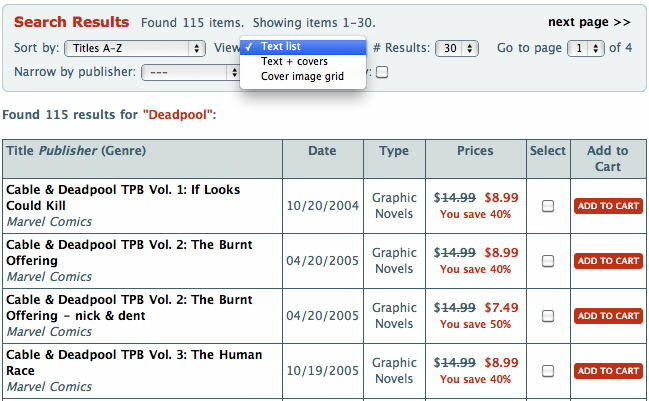 If you’re a visual person, you’ll love “Cover image grid.” The cover is shown next to the Release Date, Publisher, and Price. This one’s pretty handy if you don’t like to scroll a lot. We tend to default to “Cover image grid” around the TFAW office. 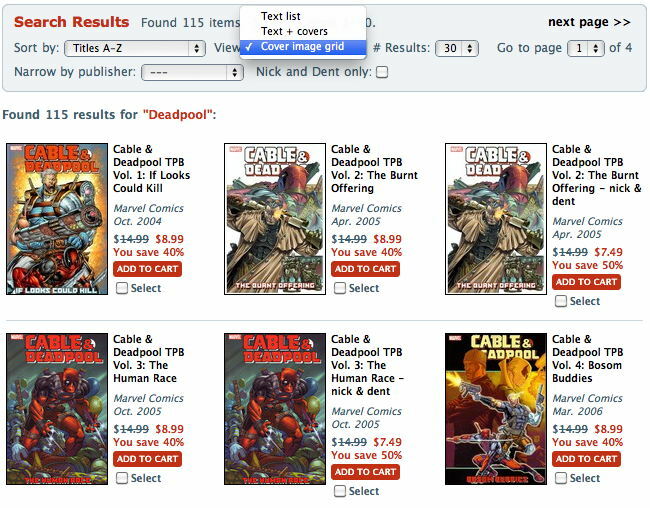 Finally, there’s “Text + covers,” which gives you all of the above info plus an brief description of the product. It’s the best way to learn a little about each product in your search query without having to click through to each and every product. Figure out which display you prefer? Have any helpful tips for other TFAW users? Have a suggestion on how we can better display product info for you? Post your comments below! Ever had a quick question for us and needed an immediate answer? You’re in luck! 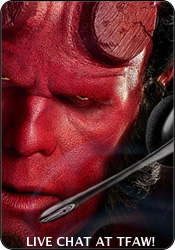 We’ve just enabled live chat at TFAW.com! Just click on that icon and a chat window will open up. You’ve got a direct line to Customer Service, ask away. Please leave a message if you have urgent matters when we’re offline. Your issue will be addressed when we get back into the office. By doing this, you’ll also help us determine if we need to expand our Customer Service hours of operation. What do you think about our newest service offering? Have you used our live chat to contact us? Let us know below. Tired of being the last one to know about hot new comics, graphic novels and collectibles? TFAW.com gets thousands of new products each month, and it’s almost impossible to keep up on all the coolest stuff we have to offer. With one of our Watch Dog Alerts, you’ll always be in the know about your favorite titles. 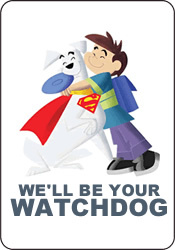 It’s easy to sign up for a Watchdog! Just sign in to your account and enter a couple of search terms. Some of the hottest Watchdog terms include: Star Wars, Buffy the Vampire Slayer, Farscape, Batman, The Walking Dead, MIke Mignola, and Watchmen. There are more than 10,000 other terms people are searching for, so sign in to your account and set up your Watchdog today. We’ll keep our ear to the ground and update you when we find something we think you’ll like.